Feedback. It’s the one word that can make almost anyone break out in a cold sweat. However, studies show that employees value feedback – even if giving it can sometimes be uncomfortable. That’s where Radical Candor comes to play. Radical candor is a term coined by Kim Scott and is all about, in her words, creating ‘bullsh*t free’ feedback zones. I had the opportunity to hear Kim speak on the topic at the First Round CEO Summit last fall and was immediately hooked: I could immediately think of instances where I had both given and received great feedback…as well as instances where both had fallen flat. Using her framework, it was easy to see why. Great managers know, building an effective team takes more than cupcakes and high fives. It takes hard work, dedication, and a commitment to providing clear direction and feedback. While this might not always feel comfortable, as a mentor of mine used to say, ‘at one level of pressure you get coal; at another, you get diamonds’. Confession time: even I struggle with this from time to time. Last year, I was doing a quarterly look back with a member of my team. She had done an exceptional job in all but one area. As I sat across from her, I found myself making excuses: “It was a rough quarter” and “we had a ton of priorities to balance”. Finally, I blurted out “you need to move faster”. She blinked back at me, and responded in a way that completely took me by surprise: “Thank you”. I had been stuck in the ‘ruinous empathy’ box. Once I moved to ‘radical candor’, we were able to focus on strategies for managing multiple, competing priorities; however, we first had to establish a solid foundation of trust. In short, she had to believe that I cared deeply about her success in order to be open to my feedback, and to grow. Many companies tasking a select number of ‘leaders’ with providing feedback through formal processes, like an annual performance review. 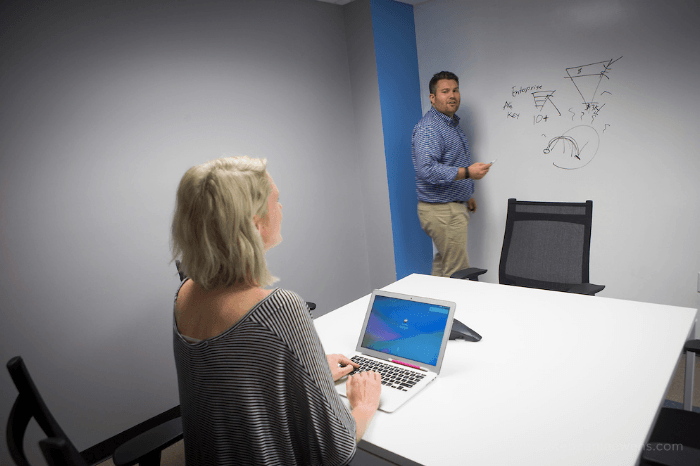 At Upserve, we’re growing…fast…and that means our employees need to be constantly growing as well – and that won’t happen if we wait and bundle feedback at a specific time of year, or if peer feedback is delivered through a game of telephone between a peer and an employee’s manager. Instead, we encourage everyday leadership at all levels. This means that each person needs to feel empowered to make decisions, take action, and – yes – provide feedback to their peers. The cornerstone of Radical candor is the ability to give feedback in a way that challenges teammates while showing how much you care about them personally. 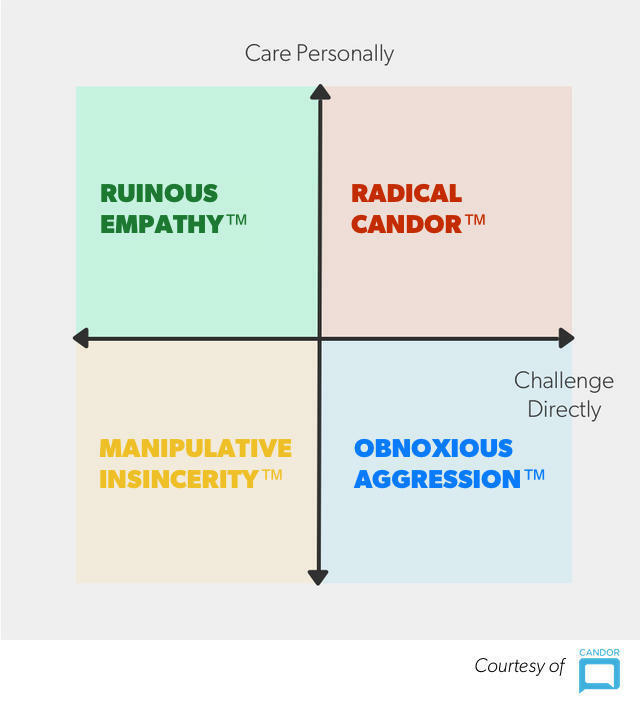 Or as Scott puts it, “The vertical axis is what I call the “give a damn” axis whereas the horizontal axis is the “willing to piss people off” axis.” Radical candor lies in the top right quadrant. Will giving feedback ever get easier? For some, maybe. For others, challenging directly might always be uncomfortable. But it is also important. One of our core values here at Upserve is, ‘One Team’. Another one is ‘openness’. Living those values means that you want what’s best for our company, and for each other. And, that you’re not afraid of the hard conversations. We don’t have 7 leaders here – we have hundreds of people who are called upon to be leaders in every conversation, every day. Are you prepared to be that kind of leader? If so, then welcome to the team. Alaina is a Rhode Island native with a passion for the beach and all things seafood. She has more than a decade of experience creating high performing teams at companies such as McKinsey & Company and Teach For America and holds a Bachelor’s Degree in Business Administration and Human Resource Management from The George Washington University. Given a choice, her last meal would be a fresh lobster roll from Kennebunk, ME.